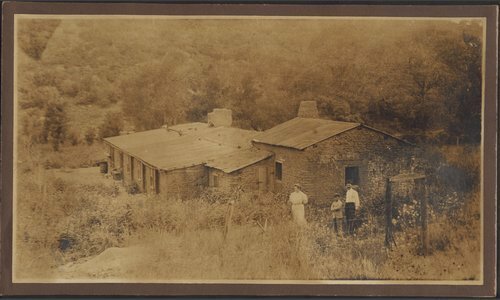 This photograph album created by the Atchison, Topeka & Santa Fe Railway Company includes photos of the Wootton Ranch in Wootton, New Mexico; the construction of Raton Pass; and various unknown persons and places. A mountain pass on the Santa Fe Trail between Trinidad, Colorado, and Raton, New Mexico, Raton Pass was developed into a road by Richard Wootton and later became a route on the Atchison, Topeka & Santa Fe Railway. Photos 1, 7, and 23 are missing from the album. Photos 27-36 are unidentified and their relationship to the Wootton and Raton Pass photos is unclear.